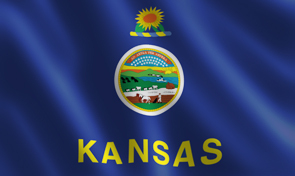 After originally being designed nearly a century ago, the only change that has been made to the Kansas state flag is the addition of "KANSAS" below the seal in 1961. This representative state flag shows the importance of agriculture in the economy. Wave this flag high, paying homage to the Louisiana Purchase with the gold and blue stripe below the state flower, the Sunflower. The 34 stars within the seal represent Kansas as the 34th state admitted to the Union, and the state motto, "Ad Astra Per Aspera" which means "Through Hardships to the Stars", is proudly displayed above the stars. Available in three different sizes to fit your space requirements. Select from heading and grommets only, pole hem only, fringe only or pole hem and fringe together. Constructed from heavy duty 200 denier nylon, finished with a canvas heading and grommets. Canvas Heading with Brass Grommets. Optional Pole Hem & Fringe Finishing. Full 1/4" Turn on All Seams. Chain Stitch on All Horizontal Seams. All Flags are quadruple stitched and back tacked (4 rows of stitching) at the fly hem.